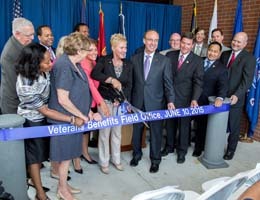 Tidewater Community College, the Virginia Department of Veterans Services and the City of Chesapeake joined together today to celebrate the opening of a new Virginia Department of Veterans Services benefits office on TCC’s Chesapeake Campus. A bright, sunny day matched the spirits of the elected officials, state representatives, veterans, active duty military, community leaders and friends of TCC in attendance at the celebration. Chesapeake is home to more than 27,000 veterans. This new central location will enable veterans to more easily access an array of benefit services earned while serving in the U.S Armed Forces. The office will complement the existing 23 benefit offices offered by the Virginia Department of Veterans Services across the commonwealth. “For the thousands of veterans who call Chesapeake home – not to mention those currently serving who one day will join their cadre – this is a very big deal,” said Chesapeake Mayor Alan P. Krasnoff. Virginia’s Secretary of Veterans and Defense Affairs John C. Harvey Jr. thanked the community for coming together and finding common ground in serving veterans and active duty military. “TCC is a flagship for how community colleges can give veterans the key to future success, after years of service,” he said. When the Virginia Department of Veterans Services reached out to the City of Chesapeake in search of new office space for their growing needs, the city saw an opportunity to partner with TCC. The college agreed to provide rent-free space for a new benefits office to provide centralized services to veterans seeking help with benefits earned from their service. John Newby, Commissioner for the Virginia Department of Veterans Services notes, “The Virginia Department of Veterans Services is delighted to be opening a benefits office on the TCC campus. More than 13,000 TCC students have ties to the military. TCC has its own Center for Military and Veterans Education with offices on each campus and local bases. “We see this as an opportunity to build the workforce with veteran career switchers on campus learning about their benefits while seeing the college in action,” added Lisa Rhine, provost of the Chesapeake Campus. The new benefits office will house two staff members this year, with an additional staffer joining the office next year. It will open on June 11.